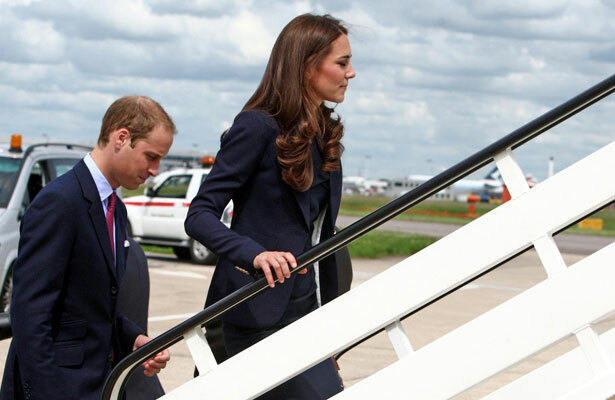 The Duke and Duchess of Cambridge wore matching navy blue outfits as they boarded a plane to Canada on Thursday. Prince William and Kate Middleton will fly on the Royal Canadian Air Force aircraft at London's Heathrow Airport. The royal couple's arrival to North America is in sync with the nation's celebration of Canada Day in Ottowa, where they will open the Calgary Stampede and canoe in the Northwest Territories. After their visit to Canada, the Prince and his wife will travel to Los Angeles.